Northern Cyprus is awash with an unusual array of colourful blooms unique to this area, which adds to the feeling that you really are truly entering paradise every time you step into this perfect part of an all-round perfect mediterranean island. Such is the abundance and range of flowers and plants indigenousness to Northern Cyprus that a lot of its natural planes and especially in the Troodos mountain range that is the spinal column of the autonomous and self-governing Turkish-speaking Northern Cyprus. Outside of its towns and built-up resort areas, are covered for a good part of the year in a carpet of wild, colourful and beautiful flowers which adds a particular uniquely dramatic tint to the north Cyprus landscape. Flowers and plants found in Northern Cyprus. The very agreeable and typically Mediterranean climate, long hot summers short mild winters book ended with brief snatches of autumn and spring, of Northern Cyprus allows the growth of olive trees and in rural areas they flourish wild and in a natural state with the foothills and further up the slopes of the Kyrenia mountains being thick with olive groves, where the altitude provides enough rainfall to nudge the olives to full fruition. Also flourishing in the lush forest that covers the Kyrenia mountain range are cedars, pine and cypress trees and Cyprus oaks, basically its fair to say what isn't covered in olives will be so in one of these four!!! The unspoilt beauty of Northern Cyprus. One of the great beauties of Northern Cyprus, besides its beautifully inclement weather, is that so much, unusually so for a favorite European holiday destination, of it is remarkably unspoilt. Indeed if you were to find yourself walking round much of it hundreds of years ago you'd be surprised at how similar many of the scenes you saw would be to those you'd see today. This means with nothing but nature to stop them many wild plants and grasses, many native to Northern Cyprus, run riot and give wonderful colours to what can be in places, especially on the lower coastal planes, a somewhat barren and empty landscape. Though Northern Cyprus isn't particularly noted as an incubator of natural wildlife, flora and fauna, it does have a fairly remarkable total of 1300 different species including 150 varieties of grass flourish within its 3000 or so square miles of land, which isn't a bad harvest and bearing in mind also that 19 of these 150 are not only native to the island but also exclusive. Hedysarum Cyprium aka The Cyprus sweet vetch. This butterfly shaped pink-flowered member of the pea family is a hardy perennial of the Northern Cyprus landscape, being one of its native fauna and when it is in season in May and June it lights up its entire native landscape, it is found mainly in the hills just south of the Kyrenia mountain range, with their striking pink hue. Delphinium caseyi aka Caseys larkspur. Another native plant that gives a vibrant shock, this time violet, to the otherwise barren North Cyprus landscape during the months of May and June, though not much of it as it is found entirely in clusters on a small rocky peak just south-west of St.Hilarion. Salvia veneris aka kythrean sage. This plant, very similar to the types used to make sage tea, grows in the crumbling sandstone hills just north of the village of Degirmenlik and has adapted itself successfully to grow on the ground to avoid the ravenous attentions of the local free-roaming goat herds. 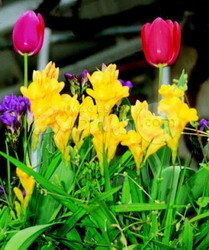 This scentless yellow and white flower graces us with its presence only in March and April. Though the Kyrenia Mountains are well watered and lush the vegetation found there and the climate is quite different to the rest of North Cyprus. In contrast to the thick thriving olive groves and trees found in the forests that envelope the mountain range with a particularly luscious green, the majority of the rest of the North Cypriot landscape is barren and more atypical of what you'd except to find in one of the Mediterranean countries. It is of these climatic conditions, long beating spells of very hot sun leading to almost constant drought caused by almost total lack of rainfall that makes Northern Cyprus such an attractive holiday destination for thousands of sun seekers every year. For a one year show of spring tulips bulbs in a warm climate, Buy the tulips bulbs and chill them for 8 to 10 weeks in a refrigerator before planting. Aim to plant at the coolest time of the year. Tulips like a good manure with a bonemeal base and should be planted 10 to 15cm (4 to 6in) deep in a semi-shady cool position in warmer climates. One of the most graceful of all tulips, this lovely species produce elegant star-like flowers, white inside with a violet base and outer petals which are carmine on the outside. They grow to about 10in (25cm) tall and require minimal chilling, making them a delightful lasting garden plant, even in milder climates. Occasional more than one flower per stern is produced. By choosing tulip bulbs from across the groups, you can have a sequence of flowering throughout spring. They range in height from 4in (10cm) to (70cm). The blooms come in many colours, including bronze, black, yellow, white, red, pink, purple, violet, green and blue.